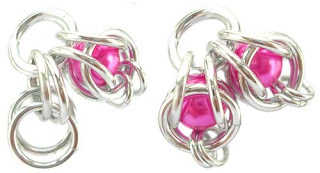 We noticed that our diy blog posts are often beading and wirework tutorials so this time, we thought of featuring a diy chainmaille tutorial and we have one of our DIY Jewelry Making Magazine Guest Contributor, Sarah Austin to help us! 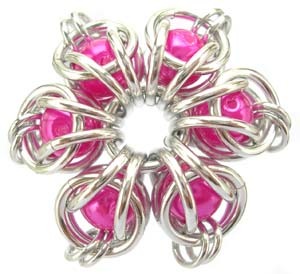 Sarah Austin runs the online shop, Beadsisters, from south west Scotland, which now has a shop with chainmaille and wirework groups. 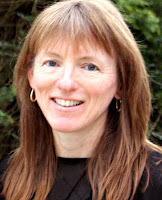 Sarah’s interest in chainmaille stems from her love of Medieval History. The maille sherte she started was abandoned though when she discovered coloured jump rings. 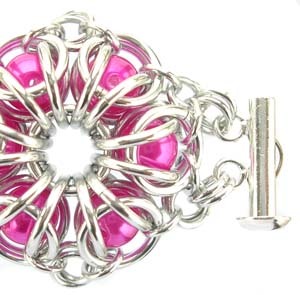 After this, chain maille became her first (and pretty much only) love when jewellery making. She loves nothing better than playing about with different weaves to see what can be made. Today, Sarah will teach you how to create Captive Pearl Bracelet! These captive pearls are caged within jump rings to create petals. 1. Link four closed large rings with two large rings. 2. 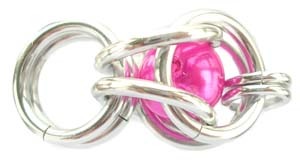 Open out the last two pairs of large rings between your thumb and forefinger and insert one bead. Trap the bead by joining the last pair of large rings with one small ring. 3. Link a second small ring to complete the first petal. The two large rings to which the captive pearl are attached are the centre rings. 4. Link two closed large rings to the centre rings using two large rings. Repeat steps 2-3 to create the second petal. 5. Continue linking petals to the centre rings until you have six petals in total. 6. To join the petals: Using one small ring, link one small ring from one petal to the small ring on the next petal. Link the same two petal rings with a second small ring but weave the second ring through the centre of the first ring before closing (to produce a crossed rings look or mobius). Continue linking the petal rings in this way. 7. Repeat steps 1-6 to make two flowers of each colour – hot pink, lemon and orange. 8. To join the flowers: Using two small rings, link one pair of the mobius joins of one flower to a second pair of mobius joins of another flower. Using two small rings, link the next pairs of mobius joins below. 9. 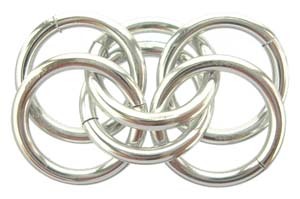 At each end of the bracelet, link the clasp to pairs of mobius joins using two small rings. Here’s the exciting part. You can also create a Captive Pearls Necklace that can match your bracelet! 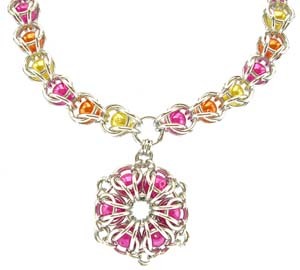 Learn how to create the necklace by joining DIY Jewelry Making Club! It’s FREE SIGN UP and you will have access to our free tutorials! SIGN UP HERE FOR FREE and then access the link Free Jewelry Making Tutorials on your dashboard.